Beat the heat this summer with non-stop water fun in Bucks County! Whether it’s a thrilling joyride down the Delaware River or a relaxing day catching some fish, Bucks County has a variety of fun ways to get wet all summer long. • Spend the day enjoying some serious water adventures at Bucks County River Country. Tube or raft down the scenic Delaware River while catching some rays and spending quality time with family and friends. If you prefer a more action-packed adventure, try kayaking or canoeing for a day of non-stop thrilling fun. • Cool down at Delaware River Tubing! Conveniently located between New York and Philadelphia, people from all over can enjoy the fun on the Delaware River. Spend the day tubing, kayaking, canoeing or rafting down the River and make sure to bring your appetite; every river rental includes a free BBQ meal from The Famous River Hot Dog Man. • With sixteen county and state parks, Bucks County offers a plethora of ways to get on the water with boating rentals available at many of our tranquil lakes. 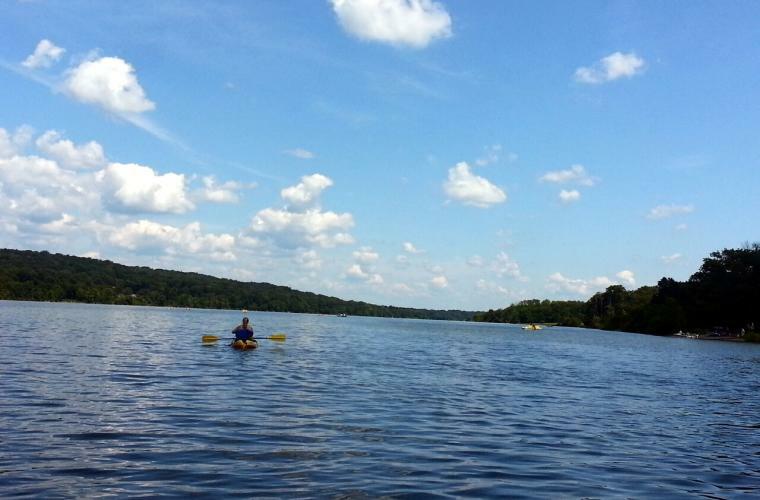 From full moon kayak tours at Core Creek Park to sailing along the wading waters of Peace Valley Park’s Lake Galena – relax and let Bucks County’s natural landscapes be your backdrop. • Let your kids embark on a water adventure of their own by floating around in Big Bird’s Rambling River at Sesame Place. With 1,000 feet of relaxing fun, this ride is perfect for children and adults of all ages. Drift through Sesame Island, past spraying geysers, rumbling waterfalls, and tropical palm trees. • Enjoy the afternoon relaxing with nature while fly fishing on the Delaware. With the Delaware River Fly Fishing Guide Service you and your friends can discover the hot spots for fly fishing on a private guided tour. Spend the day cooling off, and of course…catching some fish!